The Pala pegmatite district, in northwestern San Diego County, California, has been a widely known source of gem and lithium minerals. Formal mining operations began in the eighteen-seventies; but the most active period was from 1900 to 1922. By 1947 the district’s total recorded mineral output was valued at about three-quarters of a million dollars. This output includes 23,480 short tons of lepidolite, 2,480 pounds of tourmaline, and 1,325 pounds of gem spodumene. Small amounts of amblygonite, beryl, feldspar, and quartz also have been mined. Deposits of lepidolite and gem minerals have been extensively worked in six mines, and many additional deposits have been prospected or mined on a small scale. The dominant rocks of the district form parts of the southern California batholith, of probable Cretaceous age. Some older rocks, chiefly schists and quartzites, occur as screens, septa, and pendants. Both these and the igneous rocks are covered in places by surficial deposits of Quaternary age. At least 400 pegmatite dikes are exposed in an area of about 13 square miles. Most of them trend northward and dip gently to moderately westward, and many are marked by broad bends in strike and dip. They are remarkably persistent, and range from small stringers to large dikes with bulges nearly 100 feet thick. In several places they occur as swarms of closely spaced, subparallel dikes. In some swarms these dikes branch and converge along their strike, and in places they form thick, composite bodies in which each member dike commonly retains its identity. The pegmatites occur mainly in gabbroic rocks, and appear to have been emplaced along a well-developed set of fractures. These fractures are independent of the primary structural features of the enclosing rocks, and transect contacts between major crystalline rock units; they may well have been subhorizontal at the time of pegmatite emplacement. Some of the pegmatites are essentially homogeneous in mineralogy and texture, but most are composed of units that plainly differ from one another in lithology. Graphic granite is the chief constituent of the outermost units, or border zones, which generally are thin, discontinuous, and fine grained. It also composes most of the adjacent, coarse-grained wall zones, which ordinarily are the thickest and most persistent of the pegmatite units. Graphic granite is particularly common in the hanging-wall parts of the dikes, but constitutes nearly the full thickness of many dikes. It appears as relict masses in the fine-grained lower parts of some dikes, but also occurs as pods and thin stringers in such fine-grained pegmatite. Discoidal masses of coarse-grained pegmatite form the innermost zones, or cores, of many dikes. Such masses are generally thin and elongate, but more pod-like cores are present in the thick bulges of a few dikes. Some cores are composed of quartz, perthite, or an aggregate of these minerals, and others consist of quartz and giant crystals of spodumene. Spodumene of gem quality occurs wholly within the cores, and represents the relatively small amount of this mineral that has escaped all hydrothermal alteration. Lithiophilite and triphylite occur in or adjacent to some quartz-spodumene cores, and commonly have been altered to manganese- and iron-phosphate minerals. Some of the cores are separated from nearby wall zones by one or more intermediate zones, which form discontinuous or complete envelopes. These units are present only in the largest dikes or in dikes with thick bulges, and generally are rich in coarse-grained perthite. Fracture-filling units are widespread, and consist chiefly of quartz, albite, biotite, fine-grained muscovite, or combinations of these minerals. Some transect, wall zones, but merge with inner zones. Others lie wholly within a single zone, and still others cut across entire pegmatite bodies. There are all gradations between simple open-space fillings and replacement bodies developed along fractures. Fracture-controlled replacement bodies are superimposed upon the zonal pattern of nearly all of the pegmatites. They are composed mainly of albite, quartz, and muscovite, and, less commonly, of lepidolite and tourmaline. Such bodies are most easily recognized where they transect wall-zone graphic granite. Similar mineral aggregates occur in the central parts of many dikes, where they generally corrode the surrounding pegmatite zone. These centrally disposed units, which commonly contain residual masses of earlier minerals, include much of the district’s “pocket pegmatite,” a rock type composed mainly of fine- to coarse-grained quartz, albite, orthoclase, microcline, muscovite, lepidolite, and tourmaline. Most of the minerals are euhedral. All the gem tourmaline and beryl, as well as the commercial concentrations of lepidolite, occur in so-called “pocket pegmatite.” Such rocks actually contain very little open space, although some cavities are partly or completely filled with a clay through which gem crystals are scattered. Pocket pegmatite occurs in cores and immediately adjacent zones, chiefly along the footwalls or in the footwall parts of the cores. Fine-grained granitoid rocks, composed chiefly of quartz and albite, are common in the footwall parts of most dikes, and also occur locally in other parts of many dikes. Some varieties are essentially uniform in texture and structure. Others, known collectively as “line rock,” are strikingly marked by alternating thin layers of garnet-rich and garnet-poor pegmatite, or of schorl-rich and schorl-poor pegmatite. Layering in some of these rocks also is caused by distinct variations in texture. The Pala dikes are believed to have been formed by crystallization of pegmatite liquid that was injected along fractures during the final stages of consolidation of the southern California batholith. The pegmatite zones appear to have developed from the walls of the dikes inward, probably by fractional crystallization and incomplete reaction with residual liquid. Many, if not all, of the relations in the central parts of the most complex pegmatites seem best explainable in terms of progressive accumulation and late-stage crystallization of mineralizing fluids, with accompanying deuteric replacement of earlier-formed minerals. In order to develop a few of the larger replacement bodies, material may have been derived from other parts of the dikes, or possibly from sources farther removed. The fine-grained pegmatite units cut across the zonal structure of some dikes, and appear to have been formed in part at the expense of graphic granite. The pocket pegmatite also is at least in part of replacement origin, and is plainly younger than some of the fine-grained pegmatite. W. T. Schaller visited the district in 1903, and subsequently studied several of the minerals in the laboratories of the University of California. In 1904 he began a series of investigations for the U. S. Geological Survey that was to extend over a period of many years. His was the most systematic study of the district, and after his field work in 1924 he prepared three brief but important summaries. Although he did much laboratory work, no general report was published. A comprehensive report on the district, with a map of the areal geology and many sketch maps and sections of individual pegmatites and mines, was prepared in manuscript form but never published. M. G. Donnelly studied the pegmatites and made a reconnaissance geologic map of the district during the period 1933-35. His reports  represent the most recent geologic summaries for the district. Recent field work by the U. S. Geological Survey in the southern California pegmatite region dates from 1943, when D. J. Fisher examined and appraised numerous deposits in Riverside and San Diego Counties as potential sources of beryllium and tantalum-columbium minerals, quartz crystals, and sheet muscovite. This wartime investigation was necessarily very brief, aimed as it was at increasing the known domestic reserves of strategic pegmatite minerals. Following the cessation of hostilities in 1945, plans were made for a thorough reinvestigation of the Pala-Rincon-Mesa Grande pegmatite belt, with special emphasis upon detailed mapping and structural studies to supplement the earlier mineralogic work of Schaller. This project, of which the study of the Pala district is a part, was started in July 1946, and has been carried on under the joint auspices of the Geological Survey and the California State Division of Mines. The field investigations were completed in April 1950. The study of the pegmatites and other rocks of the Pala district was made intermittently during the period July 1946–March 1948. A total of 29 weeks was devoted to field work by Jahns, and about 10 weeks to field work during the fall and winter seasons of 1946–47 by Wright. Wright was not able to participate in the laboratory work and preparation of this report, but has checked and approved the manuscript. During the course of the field investigations, the district was mapped geologically, more than 350 pegmatite dikes were examined, one of them was mapped in detail for its entire exposed length of more than half a mile, and large parts of four other dikes were mapped. Detailed maps were made of the surface and underground workings of 16 mines, and more than 100 other mines and prospects were visited and studied. The mapping was done on several scales, ranging from 10 feet and 20 feet to the inch for most mines, through 50 feet and 100 feet to the inch for pegmatite dikes, to 660 feet to the inch for the entire district. Enlargements of aerial photographs furnished by the Agricultural Adjustment Administration were used as bases for the geologic map of the district. In the studies of the pegmatites, emphasis was placed upon petrology and structure. Particular attention was given to the recognition and interpretation of distinctive rock units within each dike, and to such broader features as the relations between shape and attitude of the dikes and structural features in the adjacent country rock. Many of the broader features were made clearer by means of the areal geologic mapping. The field studies were supplemented by preliminary mineralogic investigations in the laboratories of the California Institute of Technology, where 84 thin-sections and more than 500 samples of crushed pegmatite were examined under the microscope. Most of the microscopic studies were aimed at identification of minerals, especially feldspars, and only preliminary work on small-scale textures and structures was undertaken. The tentative conclusions regarding paragenetic relations and the origin of the various pegmatite units are therefore based primarily upon detailed megascopic study. The present report is in part economic in scope with emphasis on those features of the pegmatites and country rocks that bear most significantly upon the occurrence of commercially desirable minerals. Detailed descriptive mineralogy, country-rock petrography, and discussions of pegmatite genesis, for example, have been held to a minimum, whereas structure and descriptive petrology are emphasized. Not all controversial questions are analyzed in detail, but an attempt has been made, in presenting interpretations, to indicate the degree of assurance justified by the data at hand. The eight mines which are described briefly include nearly all those from which substantial commercial production has been obtained, and were selected to provide a satisfactory coverage of the various types of pegmatites exposed in the district. The investigations upon which this report is based were started at the suggestion of Waldemar T. Schaller of the U. S. Geological Survey, and it is a real pleasure to acknowledge his continued interest and hearty cooperation in the project. He generously supplied numerous old maps and mine descriptions, many of them prepared when the mines were in operation, and his willing counsel has been invaluable. Lincoln R. Page, Waldemar T. Schaller, and Ward C. Smith of the U. S. Geological Survey, Olaf P. Jenkins and L. A. Norman, Jr., of the California State Division of Mines, and Roy M. Kepner of the San Diego County Division of Natural Resources, visited the area and contributed many helpful ideas and suggestions. Numerous problems were discussed with John B. Hanley of the U. S. Geological Survey, who was working in the adjacent areas and who gave generously of his time in aiding the mapping of several deposits. Able field assistance was contributed from time to time by Laurence F. Gurney and Wayne E. Hall of the U. S. Geological Survey, and by Enver Altinli, Wakefield Dort, Jr., Don M. George, Jr., and Robert M. Greenwood of the California Institute of Technology. The mine and property owners in the district have been actively cooperative. Particular thanks for many personal kindnesses are due to Mr. and Mrs. R. D. Armstrong, Mr. George Ashley, and Mr. and Mrs. Monta F. Moore, of Pala; Mrs. Frank A. Salmons of La Jolla; and Mr. Frederick M. Sickler of Bonsall. Completion of the report was facilitated by Joan T. Rounds, who drafted the maps and sections, and by Florence Wiltse, who aided in the preparation of the manuscript. The colored drawings of gem crystals and cut stones reproduced in plates 13, 14, 16, 17, and 18 were the work of David P. Willoughby. The hand-tinted photograph of a kunzite crystal shown in plate 15 was donated by Waldemar T. Schaller. The aerial photographs shown in plates 25–28 were obtained by means of a special grant of funds from the California Institute of Technology. The manuscript was critically reviewed by Lincoln R. Page, John H. Eric, and Waldemar T. Schaller, who made numerous helpful suggestions. The Pala district is in northwestern San Diego County, about 45 miles north of San Diego and 80 miles southeast of Los Angeles. It lies 10 miles due east of Fallbrook and 17 miles due north of Escondido, and occupies a part of the San Luis Rey River Valley about midway between the Henshaw Reservoir and the river mouth at Oceanside (fig. 1). Like most of the other pegmatite districts in southern California, the Pala district is in the Peninsular Range province, which consists mainly of a series of mountain masses extending from about the latitude of Los Angeles southeastward into Baja California. This province is characterized by crystalline rocks, most of which are of igneous origin. Most of the pegmatites discussed in this report are exposed on the crests and along the sides of several small mountain masses north and northeast of Pala, a mission village on the San Luis Rey River. The remainder of the district flanks the river valley on the south, and lies southeast of Pala. The main, or northern part of the district occupies an area of about 5 square miles. It lies along the southwestern base of the Agua Tibia-Palomar Mountain mass, and is about 5 miles beyond the southeastern end of the elongate Elsinore-Temecula-Pechanga Valley. Topographically it is characterized by steep and locally very irregular slopes in sharp contrast to the broad, alluvial floor and associated fans of the adjacent river valley. The hills are circular to markedly elongate in plan, and show no uniform trend. They rise as much as 1500 feet above Pala, which itself is 410 feet above sea level, and the local relief in most parts of the district exceeds 800 feet. The principal eminences, listed in order from west to east, are Queen Mountain (1922 feet), Big Chief Mountain (1607 feet), Chief Mountain (1504 feet), Little Chief Mountain (1143 feet), Hiriart Mountain (1774 feet), Meadow Mountain (1927 feet), and Slice Mountain (1850 feet). The summit of the much larger Pala Mountain, in the southern part of the district, is 2026 feet above sea level. The major hills north and northeast of Pala are flanked by the alluviated canyons of such high-gradient streams as Pala Creek, Salmons Creek, McGee Creek, and Agua Tibia Creek, all of which drain southward and southwestward into the San Luis Rey River. To the northeast are the bold spurs and deep canyons of Agua Tibia Mountain. Pala is served by the paved highway that extends from Oceanside to Henshaw Reservoir. This road connects with U. S. Highway 395, the Los Angeles-San Diego “Inland Route”, 8 miles west of Pala, and with State Highway 79 at the south end of Henshaw Reservoir. Pala can be reached also from the north via the 9-mile Pala Canyon route, a winding paved road that connects with U. S. Highway 395 south of Temecula. The mine areas north and northeast of Pala are served by dirt roads. Some of the roads are no longer maintained and a few are impassable. Most of the mines can be reached by trail only. Most of the district lies within the boundaries of the Pala Indian Reservation and the Mission Indian Reserve. The fertile valley bottom soils in the vicinity of Pala are tilled by Indian families for corn, alfalfa, and other field crops, and the Agua Tibia fan farther east supports the growth of large citrus orchards. Although most irrigated farms use water from wells, water from the San Luis Rey River and Agua Tibia Creek is used in some places. Some crops are grown also on a few scattered ranches in the highland areas. Vegetation there supports small scale cattle grazing and beekeeping. The annual rainfall in the area is less than 20 inches, and there are few perennial streams. The Agua Tibia Mountain mass to the north, however, receives 25 to 40 inches of precipitation a year, and is the chief source of the ground water in the alluvial valleys near Pala. Where not under cultivation, these valleys support the growth of oak, cottonwood, and sycamore trees. In contrast, the hills on which deposits have been mined are covered with a heavy growth of chaparral interrupted only here and there by burned-over areas, and clusters of oak trees. On some north and east slopes the brush is so dense and tightly intergrown that it interferes seriously with the prospecting and geologic investigation of rock outcrops, which are abundant in most areas. Crystals of gem tourmaline were discovered in southern California by Henry Hamilton in June 1872. The occurrence, on the southeast slope of Thomas Mountain in the Coahuila Mountain district of Riverside County, comprised a few prismatic crystals of pink and green color. Several nearby deposits, discovered shortly thereafter, yielded a small output that included some excellent specimen and gem material. In 1898 commercial exploitation of the world-famous Himalaya pegmatite in the Mesa Grande district was begun, although as pointed out by Kunz,  this and other gem-bearing pegmatites in the area must have been known and worked by the local Indians for many years, as tourmaline crystals have been found in many Indian graves. 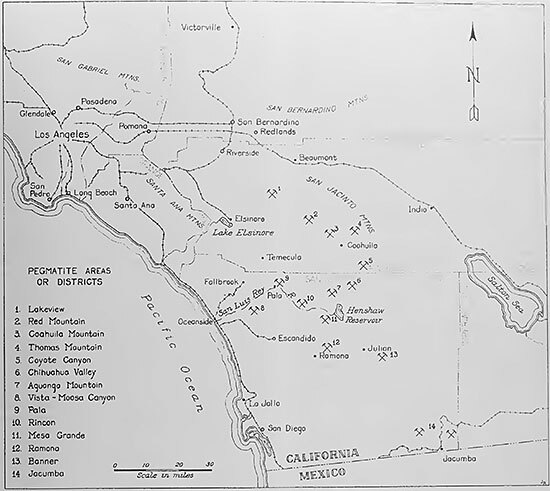 Figure 1: Index map showing locations of principal pegmatite areas and districts in southern California. The first specific mention of tourmaline in the Pala district dates from 1892, when C. R. Orcutt announced the occurrence of pink tourmaline and lepidolite in the Stewart dike. Specimens of the fine-grained mica with individual prismatic crystals and radiating crystal clusters of rubellite had been known and described nearly ten years previously, but no precise information as to their geologic occurrence or geographic location had been recorded. The deposit is said to have been discovered by an Indian deer hunter. It was first worked by Henry McGee, an old prospector who had incorrectly interpreted the rubellite as an ore of quicksilver;  later it was briefly mined as a deposit of unusual marble by Don Tomas Alvarado, a local Spanish landowner. The economic potentialities of the pegmatite minerals were not recognized until the lepidolite in a specimen from a New York collection was identified by a German chemist who was familiar with lithia occurrences in Europe. Most of the first lepidolite obtained from the Stewart deposit was sold as specimen material, but some was shipped to Germany for testing as a source of lithium, caesium, and rubidium. Development of the Stewart mine as a source of lepidolite stimulated a search for lithium deposits elsewhere in the district, and this search resulted in several discoveries of both lepidolite and gem minerals. Coarse crystals of gem-quality rubellite and other varieties of tourmaline were found in the Tourmaline King, Tourmaline Queen, and Pala Chief pegmatites, as well as in the central and northern parts of the Stewart dike. A little gem beryl and large quantities of clear crystallized quartz also were encountered. During the mining of these and other deposits of gem spodumene, tourmaline, and lepidolite in the Pala area, fine transparent quartz crystals and colorless, blue, golden, and pink to peach-colored crystals of beryl were recovered. Prospecting for gems was carried on vigorously from 1908 to 1914, and more than 50 deposits were mined. This was the golden era of activity in the district. Production declined sharply after 1914, as a result of dwindling markets and reduced prices, and never again reached the earlier levels. In 1914 the Tourmaline King mine was sold, and although the new owners spent many thousands of dollars in exploring all promising parts of the pegmatite, few marketable gems were recovered. During the 20’s and 30’s little more than assessment work was done in the largest mines, and the others were idle. By 1940, the quantities of domestic tourmaline, kunzite, and pink beryl available on the market had become so small that prices began a distinct rise. This rise continued through the decade, and resulted in some revival of mining in the district. George Ashley of Pala purchased the claims on Hiriart Mountain from Fred M. Sickler in July, 1947, and subsequently sold three of these claims to Norman E. Dawson of San Marcos. Mr. Ashley reopened the Katerina mine, and recovered small quantities of excellent kunzite from inner parts of the pegmatite. The Fargo and White Queen mines, also on Hiriart Mountain, were worked in 1948 and 1949 by Mr. Dawson. Monta J. Moore of Pala, as representative of the F. A. Salmons estate, was planning to reopen the famous Tourmaline Queen and Pala Chief mines late in 1949. 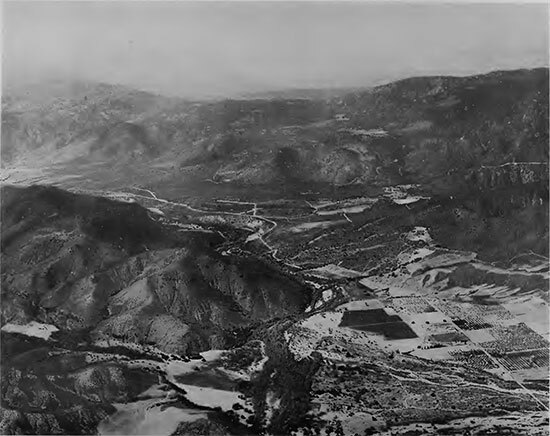 Lepidolite mining in the Pala district centered about the Stewart dike, and small quantities of lithia mica were contributed from time to time by operators in the Tourmaline King, Tourmaline Queen, Pala Chief, Katerina, and Vanderburg mines. Most of the Pala district is underlain by a series of intrusive rocks of late Mesozoic age which are part of the very large and complex southern California batholith of the Peninsular Range province. This batholith comprises many separate intrusive units, or plutons, that range in exposed diameter from a few hundred feet to ten miles or more. In composition they range from gabbro to granite; representatives of the gabbro, tonalite, and granodiorite groups are especially widespread. The metamorphic rocks of the Pala district are thin, elongate remnants of a once extensive sedimentary terrane. The remnants consist of quartzite, quartz conglomerate, meta-arkose, quartz-mica schist, quartz-mica-amphibole schist, and feldspathic amphibole schist, and are now transected and enclosed by younger igneous rocks. These metamorphic rocks are most abundant in a discontinuous, broadly curving belt that extends around the west and north slopes of Queen Mountain, the south slopes of Carver and Big Chief Mountains, and the southwest slopes of the hills and ridges that lie north and east of Hiriart Mountain. Quartzite is dominant in the western part of this belt, schist in the eastern part. The belt separates gabbroic rocks on the south from dominantly granodioritic rocks on the north. It tapers out at the southwest corner of Queen Mountain, and also at several places in the eastern part of the district. It is widest along the flanks and crest of the rugged ridge immediately east of Pala Canyon, where quartzite, quartz conglomerate, and associated metamorphic rocks have a maximum outcrop width of about 500 feet. Bedding and schistosity in the quartzitic rocks are essentially parallel. On a larger scale, the trends of schistosity, of individual beds of quartzite, and of masses of schist and other metamorphic rocks also are parallel. Linear elements, mainly rows of biotite blades, amphibole needles, or stretched pebbles in conglomerate, are locally very well developed. Their plunges are generally very steep. The rocks are tightly folded on a small scale, as shown in many outcrops, but their broad structure appears to be simple. The main quartzite-schist bell is a thin septum or screen between plutons or pluton groups, and the other smaller masses of metamorphic rocks are roof pendants and inclusions within these plutons. The metamorphic rock series in the Pala area is similar to parts of the Julian schist sequence in areas farther east, and all these pre-batholithic rocks may well be parts of the same general series. Even in the Pala area the quartzites, though dominant, are associated with much schist. The age of the Julian schist (also called “basement complex,” “schist complex,” “Julian group,” “Julian Schist Series,” and “Bedford Canyon formation”) is not accurately known, but this complex series has been correlated with fossiliferous rocks to the north and northeast, chiefly on the basis of lithology and geographic distribution. It has been suggested by Fairbanks,  Hudson,  and others, that the schist may correspond, at least in part, to the metamorphic sequence in the Santa Ana Mountains, which includes slate beds that contain Triassic fossils. That it may be in part of late Paleozoic age also seems possible, as pointed out by Hudson,  Miller,  and others. Rocks of both ages may well be represented in the series, which is assuredly older than the late Mesozoic rocks of the southern California batholith. Gabbro, norite, and associated intrusive rocks of basic composition are very abundant in the vicinity of Pala, where they occur as composite plutons of circular to roughly elliptical plan. In general they are relatively resistant to erosion, and characteristically form prominent hills and ridges with smooth, regular slopes and thin mantles of dark reddish-brown soil. Examples of such eminences are Pala Mountain, Queen Mountain, Chief mountain, and Hiriart Mountain. Individual rock types include medium- to coarse-grained gabbro and norite, olivine gabbro and norite, hornblende-rich gabbro and norite, hornblende-biotite gabbro and norite, and quartz-bearing gabbro and norite. All these types have been included under the general name San Marcos gabbro by Miller,  and in some areas to the southeast they have been designated as Cuyamaca basic intrusive by Hudson,  Donnelly,  and others. The most common rock type in the Pala district is a dark-gray, medium-grained, equigranular, homogeneous olivine-hornblende-hypersthene gabbro. Its principal constituents, listed in order of decreasing abundance, are calcic plagioclase, hornblende, olivine, augite, and hypersthene. Accessory minerals include biotite, ilmenite, magnetite, pyrite, pyrrhotite, and spinel. All but the most mafic or fine-grained gabbros and norites yield boulders with somewhat light-colored surfaces. These surfaces are strongly pitted, because of the relatively rapid weathering of plagioclase. On freshly broken surfaces, the plagioclase is greenish to bluish-gray, and gives a distinctive color to the rock. In many places two or more rock types are interpenetrated in a complex way. The various facies of gabbroic rocks are combined as a single unit in plate 1, and are identified merely as “gabbro” on the detailed maps of pegmatite deposits. The broad structure of the gabbroic masses is best shown by the fringing remnants of earlier quartzite and schist, which outline them on the west, north, and east (pl. 1). Their internal structure is much more complex, as most of them are composites of several rock types. Flow layering is well developed in some of the hornblendic rocks, but is confined to such small areas that it cannot be used effectively in deciphering the large-scale structures. Of even more local occurrence are nodular, orbicular, and auto-injection structures,  and also abundant pegmatitic masses of apparent segregation origin. The gabbro, norite, and associated basic rocks contain inclusions of quartzite and schist, and appear as apophyses in larger masses of these rocks. Thus they are clearly younger than the metamorphic series, although they are the oldest of the plutonic rocks exposed in the Pala district. At least two varieties of tonalite are present in the area. Both rocks are distinctly lighter in color than the gabbros and norites, and have feldspar grains that are generally white to light-gray in hand specimens. Both tonalites commonly form slopes covered by rounded boulders that range in diameter from 1 foot to more than 10 feet, in contrast to the smooth slopes underlain by gabbroic rocks. One variety of the tonalite is a medium- to coarse-grained, moderately light-gray rock that contains scattered ovoid inclusions of gabbro, quartzite, and schist. It forms dikes and thick, tongue-like masses on Hiriart Mountain, and composes the two small, low hills immediately southeast of Queen Mountain (pl. 1). The other variety is fine- to medium-grained, medium to dark gray, and in most places is distinctly schistose. It is characterized by abundant discoid to elongate inclusions of darker, finer-grained rock, which are strung out parallel to the planar structure of the host rock. This finer-grained variety of tonalite composes most of Little Chief Mountain, and forms dikes and larger masses on some of the low hills southwest of McGee Flats and on the larger hills west of Pala. It also forms large, irregular dikes on the crest and slopes of Chief Mountain. The relatively dark, fine-grained tonalite consists typically of andesine or labradorite, biotite, hornblende, quartz, augite, and minor hypersthene, with accessory magnetite, apatite, sphene, and zircon. The coarser-grained, lighter-colored tonalite consists of more sodic plagioclase (in the andesine-oligoclase range), biotite, hornblende, orthoclase, and rare augite and hypersthene. Accessory minerals are sphene, apatite, zircon, and magnetite. The dikes and other masses of darker gray, finer-grained tonalite are distinctly younger than the enclosing gabbroic rocks, and are in sharp contact with them in most places. The trends of these contacts are closely reflected by the well-developed schistosity and streaked pattern of the platy inclusions that are characteristic of the tonalite. This rock is in contact with the coarser tonalite in only a few places, where the two types appear to merge. About a quarter of a mile south-southwest of the summit of Chief Mountain, however, the coarser type has formed apophyses in the finer-grained tonalite, and contains inclusions of this evidently earlier rock. Similar relations are exposed near the west end of a small quarry that lies on the north side of the highway immediately west of Pala. On the basis of its texture, mineral composition, and general age relations, the finer-grained tonalite is assigned to the Bonsall, one of the most extensive rock types in the Peninsular Range province. The less abundant, coarser type also may correspond to parts of the Bonsall, or it may be more closely allied to one of the other tonalites of Miller,  Larsen,  Merriam,  and others. Coarse-grained granodiorite underlies much of the northern part of the district, where it appears as the eastward and southeastward tapering prong of a very large intrusive mass (pl. 1). It is resistant to erosion, and forms rough, craggy mountains with boulder-strewn slopes that contrast with the relatively smooth and even slopes of the nearby gabbro mountains. The rock has been termed the Woodson Mountain granodiorite by Miller  and Larsen,  and is the most widespread granodiorite in the Peninsular Range batholith. The rock is rather uniformly coarse-grained and light gray, with abundant phenocrysts of potash feldspar as much as half an inch in diameter. Its constituent minerals, listed in order of decreasing abundance, are oligoclase, quartz, orthoclase and microcline, biotite, muscovite, and hornblende, with accessory apatite, magnetite, sphene, and zircon. The mafic minerals rarely amount to more than 8 percent of the total, and in most places are much less abundant. Typically the large granodiorite pluton is massive, but has well-developed schistosity and foliation along its borders, generally in a belt not more than 1200 feet wide. Although very irregular in detail, these planar features are essentially parallel, and are oriented in crude conformity with the adjacent wallrock contacts. A coarse-grained migmatitic rock is exposed on the west side of Queen Mountain, where it forms many small cliffs on both walls of a narrow canyon. It consists of irregularly contorted biotite-bearing layers ⅛ to 1 inch thick, separated by biotite-free layers of similar thickness. It appears to be a gneissic hybrid rock developed from a schistose terrane, but its overall composition is only slightly different from that of the flanking granodiorite. Inclusions of schist, quartzite, tonalite, and gabbroic rocks are widespread, but are nearly everywhere less abundant than those in the tonalites. Where the granodiorite is schistose, the inclusions are oriented in essential conformity with this structure, but elsewhere they show no consistent orientation. The relative ages of the rocks are further demonstrated by dikes of granodiorite that locally cut the tonalites and gabbroic rocks, and by a thick intrusive prong of granodiorite on the southeast corner of Hiriart Mountain (pl. 1). A contact zone between granodiorite and gabbro is almost continuously exposed on the north wall of Castro Canyon, due north of the summit of Hiriart Mountain. Another variety of felsic granodiorite, well foliated and locally very schistose, is much finer-grained than the typical Woodson Mountain granodiorite. In a general way it forms the outer part of a thin, “two-ply” envelope around the large gabbroic mass north and northeast of Pala, and is separated from the gabbro in most places by the thin screen of quartzite and schist previously described. The outcrop belt of this fine-grained granodiorite ranges in width from a few feet to 700 feet or more. It is remarkably continuous, but pinches out in a few places. The rock is very resistant, and appears as large boulders and craggy masses. From a distance it cannot be distinguished from the typical coarse-grained Woodson Mountain granodiorite that bounds it on the west, north, and east. The fine-grained granodiorite is composed of quartz, microcline and orthoclase, oligoclase, biotite, muscovite, and scattered accessory minerals. The quartz and potash feldspar are more abundant than in the typical Woodson Mountain granodiorite. Numerous inclusions and wispy remnants of quartzite and other metamorphic rocks are present in many areas, and in places there are all gradations between these pre-batholithic rocks and typical granodiorite. Masses of fine-grained lamprophyre cut the gabbroic rocks in many places. They are most abundant in the olivine gabbros and norites, in which they form both thin, irregular lenses and stringers, and swarms of closely spaced subparallel dikes. These masses are especially common on the southeastern part of Queen Mountain, where they range in thickness from less than an inch to about a foot. Most of them are traceable for strike distances of more than 30 feet. The constituent minerals include plagioclase in the bytownite-anorthite range, hornblende, and magnetite, with local ilmenite, hypersthene, and augite. The bulk composition of a given dike is generally little different from that of the adjacent country rock, and such dikes probably were derived from sources within the gabbroic plutons themselves. Aplitic dikes of granodioritic composition are exposed on the west side of Chief Mountain, on a low hill northwest of Hiriart Mountain, and on the ridge immediately west of Pala (pl. 1). They are more resistant to weathering than the enclosing rocks, and consequently stand out as riblike masses or as rows of elongate boulders. They are rarely more than 6 feet thick, but are 100 feet to as much as half a mile long. They transect all the other rocks described in the foregoing paragraphs, but are themselves cut by younger dikes of pegmatite. Most of the aplitic dikes consist of quartz, potash feldspar, oligoclase, muscovite, biotite, and scattered magnetite, with rare garnet, zircon, tourmaline, and other accessory minerals. The rocks are light-gray to buff, fine-grained, and thinly schistose. They are even-grained in some places, but elsewhere they grade inward from aplitic borders to pegmatitic centers. In a few places they closely resemble the younger pegmatite dikes, but grade along the strike into typical aplitic rocks that are cut by irregular veinlike masses of pegmatite and quartz. Pegmatite dikes are abundant in the gabbroic rocks, and occur also in the older metamorphic rocks and in the tonalite and granodiorite members of the batholithic sequence. They transect the tonalite and granodiorite dikes on Chief Mountain, and appear to be among the youngest rocks exposed in the district. These pegmatite dikes range in thickness from less than an inch to nearly 100 feet, with an average thickness of slightly less than 10 feet. Most of them trend north and dip westward at small to moderate angles. They are described in greater detail farther on. Post-batholithic rocks in the Pala district comprise coarse-grained fan and valley-fill deposits of Quaternary age. The oldest unit, a series of well-bedded, poorly consolidated arkoses and pebble-to-boulder conglomerates, has been termed the Pala conglomerate by Ellis. It appears to be a complex fan deposit that was derived principally from Agua Tibia Mountain and other high areas to the north. It underlies the broad fan surface that extends westward and southward from the mouth of Agua Tibia Canyon, and is well exposed in several highway cuts and on a long, steep cliff cut by the San Luis Rey River. The same rock forms the old fans immediately north and northeast of Pala, and also a 5- to 40-foot capping over crystalline rocks on McGee Flats. Its thickness at several places near Pala is at least 250 feet. The sedimentary structures in the formation are typical of fan deposits, and include well-defined but lenticular bedding and irregular alternations of coarse-grained and relatively fine-grained debris. Some parts of the formation, in contrast, are composed wholly of thick, boulder-rich beds. An unusually fine-grained facies is exposed along the highway near the southeastern corner of the area shown in plate 1, and still finer grained deposits have been penetrated in wells beneath the valley bottom farther southeast. These deposits, which contain abundant plant material, may well have been laid down in a short-lived lake that was formed behind the large, rapidly constructed Agua Tibia fan. The Pala conglomerate contains scattered vertebrate remains, chiefly Pleistocene horses and elephants. The formation is probably correlative, either wholly or in part, with the Pleistocene arkoses of the Elsinore-Temecula-Pechanga Valley to the north. The valleys of all the principal streams have floors of Recent alluvium. It forms the broad flat at Pala, and also the somewhat narrower river-bottom flats to the east. Some alluvium is present in the narrow ravines and broad washes that have been cut into the old fans of Pala conglomerate, and in many areas of low topographic relief the two units are not easily distinguished. The alluvium consists mainly of sand, gravel, and interbedded silt, but well logs indicate that there are concentrations of large boulders in the lower part. Accumulations of slope debris are present on most of the mountains, especially in areas of locally extreme relief. Weathered gabbro has formed small landslides on the south slopes of Queen Mountain and the north slopes of Pala Mountain ; larger landslides involving gabbro and pegmatite on Hiriart Mountain are characterized by concentrations of pegmatite boulders that are as much as 15 feet in diameter. Some of the boulders have been prospected for pegmatite minerals. Most of the crystalline rocks are marked by distinct planar structures. These structures include mineral layering, oriented inclusions of discoid or tabular form, and oriented plates or tablets of biotite, hornblende, feldspar, and other minerals. Bedding is distinct in many of the metamorphic rocks. Of local prominence are linear elements, generally with steep plunges, that are formed by the axes of “stretched” pebbles in beds of conglomerate, the axes of elongate mineral grains, intersections of bedding and schistosity, and lines of biotite flakes, hornblende needles, and other mineral grains. The planar and linear elements are only locally well developed in the gabbroic rocks, and show no general or consistent pattern. In contrast, the foliation and schistosity of the tonalite and granodiorite rock masses are typically parallel to their contacts, and appear to have been mainly the result of flowage during intrusion. The planar structure of the fine-grained granodiorite is an exception, in that it is probably in part a relict feature preserved from older rocks at whose expense much of the granodiorite was developed. Planar elements which are very abundant in the pegmatite dikes are described in a later section. Much of the schist-quartzite series seems to have a very simple structure, even though the beds are on edge in most places. In detail, however, some beds are closely folded, crinkled, or otherwise distorted. The remnants of these rocks are so small that it has not been possible to determine the general attitude and pattern of such folds. Ptygmatic folds are locally abundant in the gabbroic and granodioritic rocks, and many of them arc outlined by quartz or by thin aplitic masses. These flexures vary in orientation and degree of development from one place to another, and many appear to be related to nearby boundaries of the enclosing plutons. The Woodson Mountain granodiorite exposed on the southwestern face and southeastern end of Slice Mountain is much sheared on a small scale, and in many places has been converted to a flaser gneiss. This severely sheared rock forms a southeastward tapering prong between two masses of gabbroic rocks. The crystalline rocks are cut by many joints, most of which form well-developed sets. Some of the fractures are spaced so closely that the host rock has a sheeted appearance, but most are at least ten feet apart. In few places, however, are the rocks free from joints for distances of more than 50 feet. Joint structure is best shown in the granodiorites, because parts of them have been eroded leaving large residual boulders distributed in regular patterns. Two general classes of joints are present in most areas. One ordinarily comprises two sets that dip steeply and differ in strike by 60 degrees or more. They are very prominent in the granodiorite along the western and northern edges of the district, where one set is subparallel to the contact zone between granodiorite and older rocks, and the other is nearly normal to it. The other class of joints bears no systematic relation to the shapes or attitudes of the plutons, but instead appears to be related to some broader feature. Typical of this class are fractures that trend north and dip gently to moderately west in the gabbro and associated rocks. They transect contacts between different crystalline rocks, and are remarkably uniform in attitude. They are of considerable interest in the study of the Pala pegmatites, as it is along many of these joints that the pegmatite dikes were emplaced. Perhaps the outstanding tectonic feature in the Pala region is the Elsinore fault, which bounds the pegmatite district on the northeast. It is actually a fault zone, half a mile to more than a mile wide, that comprises many sub-parallel breaks, zones of gouge and breccia, and horses of relatively unbroken rock. It has a profound effect upon local topography, appearing as a gentle elongate depression. The southwesternmost fault of the Elsinore zone lies along the edge of McGee Flats and traverses Meadow Mountain, and the northeasternmost fault lies beyond the mapped area shown in plate 1. These and other breaks trend northwest and dip very steeply. These faults have had several thousand feet of movement, perhaps, but neither the magnitude nor direction of movement is determinable from evidence in or near the Pala district. That the fault zone is still active is demonstrated by the many earthquake epicenters along its trace. Less significant faults are exposed in several parts of the pegmatite area. One of them crosses the saddle between Chief and Little Chief Mountains, and separates gabbro on the north from tonalite on the south. It is traceable for at least a mile west of Pala, and evidently has a moderately large displacement. Numerous minor faults, which have east to northeast trends and steep dips, cut and offset pegmatites on the cast side of Queen Mountain, and a few similar faults appear elsewhere in the district. None of them has displacements that exceed 50 feet. Plates 1 and 2 are available in this PDF. To return to text, click on the reference number. 1. The term “pegmatite,” as herein applied, is defined as an igneous rock, generally irregular in texture, that is at least in part very coarse-grained. 2. Schaller, W. T., The genesis of lithium pegmatites: Am. Jour. Sci. 5th ser., vol. 10, pp. 269–279, 1925. 3. Kunz, G. F., Gems, jewelers’ materials, and ornamental stones of California: Calif. Min. Bur. Bull. 37, 155 pp., 1905. 4. Waring, G. A., The pegmatyte veins of Pala, San Diego County: Am. Geologist, vol. 35, pp. 356–369, 1905. 5. Merrill, F. J. H., Mines and mineral resources of San Diego County, California: California Min. Bur., Rept. XIV, pp. 691–700, 706–708, 1914. 6. Schaller, W. T., op. cit., 1925. Schaller, W. T., Mineral replacements in pegmatites: Am. Mineralogist, vol. 12, pp. 59–63, 1927. Schaller, W. T., Pegmatites, in ore deposits of the western states, pp. 144–151, Am. Inst. Min. Met. Ore, New York, 1933. 7. Donnelly. M. G., The lithia pegmatites of Pala and Mesa Grande, San Diego County, California: California Inst. Tech., unpubl. Ph.D. Thesis, 1935. 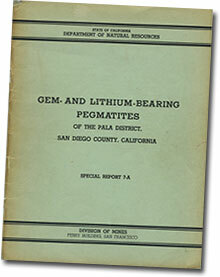 Donnelly, M. G., Notes on the lithium pegmatites of Pala, California: Pacific Mineralogist, vol. 3, pp. 8–12, 1936. 8. Kunz, G. F., Gems, jewelers’ materials, and ornamental stones of California: California Min. Bur. Bull. 37, pp. 23–24, 1905. 9. Kunz, G. F., op cit., p. 124, 1905. 10. Kunz, G. F., On a new lilac colored spodumene, San Diego County, California: Science, new ser., vol. 18, p. 280, 1903. 11. Schaller, W. T., Spodumene from San Diego County, California: California Univ. Dept. Geol. Sci., Bull., vol. 3, pp. 265–275, 1903. 12. Larsen, E. S., The batholith of southern California: Science, new ser., vol. 93, pp. 442–443, 1941. Larsen, E. S., Batholith and associated rocks of Corona, Elsinore, and San Luis Rey quadrangles, southern California: Geol. Soc. America, Mem. 29, 182 pp., 1948. Larsen, E. S., Time required for the crystallization of the great batholith of southern and Lower California: Am. Jour. Sci., vol. 243-A, pp. 399–416, 1945. Larsen, E. S., and Keevil, N. B., Radioactivity of the rocks of the batholith of southern California: Geol. Soc. America Bull., vol. 58, p. 484, 1947. 13. Fairbanks, H. W., Geology of San Diego County; also of portions of Orange and San Bernardino Counties: California Min. Bur., Kept. 11, pp. 76–120, 1893. 14. Merrill, F. J. H., Geology and mineral resources of San Diego and Imperial Counties, California: California Min. Bur., Rept. 14, pp. 636–722, 1914. 15. Ellis, A. J. and Lee, C. H., Geology and ground waters of the western part of San Diego County, California: U. S. Geol. Survey Water Supply Paper 446, pp. 50–76, 1919. 16. Miller, W. J., Crystalline rocks of southern California: Geol. Soc. America Bull. vol. 57, pp. 476–488, 1946. 17. Hudson, F. S., Geology of the Cuyamaca region of California with special reference to the origin of the nickeliferous pyrrhotite: California Univ., Dept. Geol. Sci., Bull., vol. 13, pp. 175–252, 1922. 18. Miller, W. J., A geologic section across the southern Peninsular Range of California: California Jour. Mines and Geology, vol. 31, pp. 115–142, 1935. 19. Everhart, D. M., Geology of the Cuyamaca Peak quadrangle, San Diego County, California: California Div. Mines Bull. 159, in press, 1951. 20. Fraser, D. M., Geology of the San Jacinto quadrangle south of San Gorgonio pass, California: California Jour. Mines and Geology, vol. 27, pp. 494–540, 1931. 21. Donnelly, M. G., Geology and mineral deposits of the Julian district, San Diego County, California: California Jour. Mines and Geology, vol. 30, pp. 331–370, 1934. 22. Creasey, S. G., Geology and nickel mineralization of the Julian-Cuyamaca area, San Diego County, California: California Jour. Mines and Geology, vol. 42, pp. 15–29, 1946. 23. Dudley, P. H., Geology of a portion of the Perris block, southern California: California Jour. Mines and Geology, vol. 31, pp. 487–506, 1935. 24. Merriam, Richard, Igneous and metamorphic rocks of the southwestern part of the Ramona quadrangle, San Diego County, California: Geol. Soc. America Bull., vol. 57, pp. 223–260, 1946. Kessler, H. H., and Hamilton, W. R., The orbicular gabbro of Dehesa, California: Am. Geologist, vol. 34, pp. 133–140, 1904. Lawson, A. C., The orbicular gabbro at Dehesa, San Diego County, California: California Univ., Dept. Geol. Sci., Bull., vol. 3, pp. 383–396, 1904. Schaller, W. T., Orbicular gabbro from Pala, San Diego County, California: U. S. Geol. Survey Bull. 490, pp. 58–59, 1911. Miller, F. S., Anorthite from California: Am. Mineralogist, vol. 20, pp. 139–146, 1935. Hurlbut, C. S., Dark inclusions in a tonalite of southern California: Am. Mineralogist, vol. 20, pp. 609–630, 1935. Miller, F. S., The petrology of the San Marcos gabbro, southern California: Geol. Soc. America Bull., vol. 48, pp. 1397–1425, 1937. Miller, F. S., Hornblendes and primary structures of the San Marcos gabbro, southern California: Geol. Soc. America Bull., vol. 49, pp. 1213–1232, 1938. Osborn, E. F., Structural petrology of the Val Verde tonalite, southern California: Geol. Soc. America Bull., vol. 50, pp. 921–950, 1939. Merriam, Richard, A southern California ring-dike: Am. Jour. Sci., vol. 239, pp. 365–371, 1941. Merriam, Richard, Orbicular structures in aplite dikes near Ramona, California: Am. Jour. Sci., vol. 246, pp. 129–137, 1948. 26. Fairbanks, H. W., op. cit, pp. 82, 87, 1893. 27. Hudson, F. S., op. cit., pp. 188–190, 1922. 29. Miller, W. J., op. cit., pp. 477–485, 1946. 30. Miller, F. S., Petrology of the San Marcos gabbro, southern California: Geol. Soc. America Bull., vol. 48, pp. 1399–1400, 1937. 31. Hudson, F. S., Geology of the Cuyamaca region of California, with special reference to the origin of the niekeliferous pyrrhotite: California Univ., Dept. Geol. Sci., Bull., vol. 13, pp. 193–207, 1922. 32. Donnelly, M G., Geology and mineral deposits of the Julian District, San Diego County, California: California Jour. Mines and Geology, vol. 30, pp. 3 11–342, 1934. 33. Schaller, W. T., Orbicular gabbro from Pala, San Diego County, California: U. S. Geol. Survey Bull. 490, pp. 58–59, 1911. Miller, F. S., Hornblendes and primary structures of the San Marcos gabbro: Geol. Soc. America Bull., vol. 49, pp. 1220–1230, 1938. 34. Hurlbut, C. S., Dark inclusions in a tonalite of southern California: Am. Mineralogist, vol. 20, pp. 609–630, 1935. Merriam, Richard, Igneous and metamorphic rocks of the southwestern part of the Hamona quadrangle, San Diego County, California: Geol. Soc. America Bull., vol. 57, pp. 243–246, 1946. Larsen, E. S., and Keevil, N. B., Radioactivity of the rocks of the batholith of southern California: Geol. Soc. America Bull., vol. 58, p. 488, 1947. 35. Miller, F. S., op. cit, pp. 1408-1409, 1937. 36. Larsen, E. S., Batholith and associated rocks of Corona, Elsinore, and San Luis Rey quadrangles, southern California: Geol. Soc. America Mem. 29, pp. 53–57, 70–76, 1948. Larsen, E., S., and Keevil, N. B., op. cit., 1947. 37. Merriam, Richard, op. cit., pp. 240–243, 247–250, 1946. 38. Miller, P. S . op. cit., p. 1399, 1937. 39. Larsen, 10. S., op. cit.. p. 76, 1948. Larsen, 10. S., and Keevil, N. B., op. cit., p. 489, 1947. 40. For a brief discussion of these features, see: Jahns, R. H., Discussion in Origin of granite: Geol. Soc. America, Mem. 28, pp. 94–95, 1948. 41. Ellis, A. J., and Lee, C. H., Geology and ground waters of the western part of San Diego County, California: U. S. Geol. Survey Water-Supply Paper 446, p. 70, 1919. The important mines of Pala district are on three low gabbroic hills northeast of the village of Pala. From east to west these hills are called Hiriart Hill, Pala Chief Mountain, and Tourmaline Queen Mountain. Hiriart Hill contains the Sickler mine and the Caterina, Hiriart, Fargo, El Molino, K. C. Naylor, Vandenburg, Senpe, and several other prospects. The Pala Chief mine is near the summit of Pala Chief Mountain and several other small mines and prospects are found on the west flank of this mountain. The Stewart mine, the Tourmaline Queen mine, the Tourmaline King mine, the Ed Fletcher, Jr., mine, and numerous small prospects are found on Tourmaline Queen Mountain. W. P. Blake, writing in the Second Annual report of the State Mineralogist for 1892, records the discovery in southern California of rubellite and lepidolite. From the description of the material and the name of the general region that Blake gave, the place of origin seems to have been Pala. The pegmatite dike now called the Stewart dike, from the mine which has been developed in its southern end, is visible from the main road in the San Luis Rey valley, a communication route that has been in constant use by white men since the time of the Spanish missions. The remarkable color of the purple lepidolite and pink tourmaline occurring in it made the dike known to the Indians, who showed specimens from it to the white men. The red color in the tourmaline suggested to a prospector named Magee the possible presence of cinnabar and he accordingly staked out a claim. Failing to extract mercury from the rock, Magee abandoned the claim and it was subsequently relocated as a marble quarry. As might be expected, this venture failed too. Some time in the late 80’s, a German chanced to see a specimen of lepidolite in New York which came from Pala and informed his American acquaintances of its value. For many years, however, no attempt was made to mine lepidolite as a lithium ore. Eighteen tons of lepidolite and rubellite were produced from the Stewart mine in 1892, most of which was used as specimen material. Substantial commercial production of lepidolite commenced about 1900, and in the next few years about three thousand tons of lepidolite are and a considerable amount of amblygonite ore were produced from the Stewart mine. Toward the end of the World War several thousand tons of lepidolite ore were produced from the Stewart mine. About a decade after the first shipment of lepidolite and rubellite was made from the Stewart mine, M. M. Sickler and his son, Frederick, were doing assessment work on a claim held as a lepidolite location on Hiriart Hill, about a mile and a half east of the village of Pala. Mining operations had uncovered a mass of chalky substance containing very large quartz crystals. While removing the quartz crystals there was found embedded in clay, beautiful, clear crystals, most of which were lilac-colored, some straw-colored, and some colorless. After a fruitless attempt to identify the mineral, specimens of it were sent in December, 1902, to Tiffany & Company, of New York, which were identified as spodumene by Dr. George F. Kunz. Dr. Kunz had previously found small, altered pieces of lilac spodumene at Branchville, Connecticut. 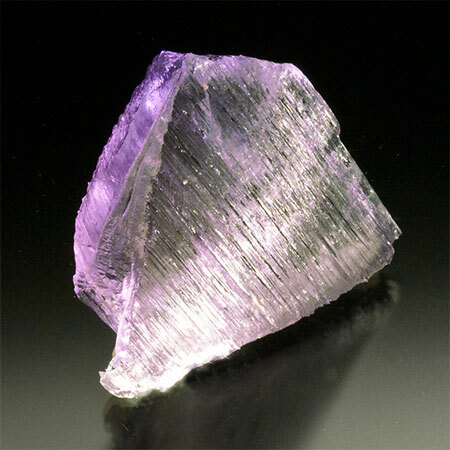 The name kunzite was given to the clear and colored varieties (except green) of spodumene by Charles Baskerville in honor of Dr. Kunz. The next year, 1903, the Pala Chief mine was discovered by two Basque prospectors, Bernardo Hiriart and Pedro Teiletch. It was worked for many years by Mr. Frank A. Salmons and yielded most of the kunzite production in the United States, as well as abundant and beautiful gem tourmaline. The Tourmaline Queen mine, the Tourmaline King mine and the Ed Fletcher, Jr., mine, were discovered about 1903. The record of the rocks exposed around Pala is dominantly a record of metamorphism, igneous intrusion, pegmatization, and erosion. The only unmetamorphosed sedimentary rock in the region is the valley fill, which has been locally designated the Pala conglomerate and classified as Quaternary in age. The student of minerals will be able to gain a better understanding of the pegmatite dikes by placing them in relation to the other rocks of the region. Some time toward the end of the Jurassic period the whole Pacific Coast region of the North American continent suffered intense crustal deformation. The pre-existing sedimentary crust was warped and squeezed into tight folds and enormous amounts of igneous material moved upward in pulsating waves into the crust, mingling with it, assimilating it, and replacing it. In the Pala district the only remnants of the initial sedimentary cover are rocks which are now quartzite and gneiss. A prominent mass of quartzite is exposed just north of the Tourmaline King mine and smaller masses are common elsewhere. Much of the rock that has been classified as granodiorite or granodiorite gneiss is probably a sediment which has been changed structurally and mineralogically by igneous juices which have not, however, contributed materially to the bulk composition of the rock. The first igneous rocks intruded are gabbro. Hiriart Hill, most of Pala Chief Mountain, and Tourmaline Queen Mountain are made up of gabbroic rock. It has already been pointed out that these hills also contain the important pegmatite dikes. The gabbro was followed by quartz diorite, and it in turn, by gran0diorite. Quartz diorite is well exposed in the small knoll about a half mile northeast of the Indian cemetery. Grandiorite is exposed in Pala Canyon for several miles along its course. The pegmatite dikes were emplaced after the intrusion and consolidation of the gabbroic, quartz dioritic, and granodioritic masses. The lithium pegmatites of Pala are tabular bodies, ranging in thickness from a few feet to a hundred feet. The latter thickness is attained in only one place, the southern end of the Stewart dike on Tourmaline Queen Mountain. Most of the lithium pegmatites average about ten feet thick. With one or two minor exceptions, the dikes strike northwesterly and dip southwesterly. In the more important dikes it has been observed that the dip is low—from ten to twenty degrees—near the outcrop and that in depth the dip steepens to forty degrees, or more. In other words, a typical dike resembles one limb of an anticline. It has also been observed that the less-steep portion of the dikes have been the most productive in economic and gemworthy minerals. The longest dike, the Stewart, is continuously exposed for over a half mile along its strike. Like most of the other dikes, it is truncated on one end by erosion. The Pala Chief dike, parts of the Ed Fletcher, Jr., dike, and some other dikes on Pala Chief Mountain, have been called blanket veins by the miners. Erosion has removed the country rock down to the top of these dikes and they now form blanket bodies on the sides of the hills. The dikes are asymmetrical from top to bottom. The upper portions of the dikes are made up of graphic granite, with which is usually found clumps of quartz, microc1ine and black tourmaline. The lower part of the dikes consist of banded garnet albite aplite, a mineral assemblage called line rock by the miners. In the gem-bearing dikes the middle of the dike, between the garnet aplite and the graphic granite, contains the pay streak, in which the lithium minerals are concentrated. Gem tourmaline, kunzite, beryl, and gem garnet are usually found in clay-lined pockets in the pay streak. Clear and smoky quartz crystals, microcline and orthoclase crystals, large muscovite crystals, coarse grained cleavelandite (albite), and coarse grained lepidolite are almost always associated with the pay streak or with offshoots from it. Feldspars are abundant in all of the dikes and in most places make up the bulk of the material. Microcline is found as an intergrowth with quartz and albite in graphic granite. It also occurs massive and as well formed crystals in the pay streak. Here it is in perthitic intergrowth with albite. Albite, in addition to its occurrence as an intergrowth in graphic granite or in microcline microperthite, is found also as the platy variety, cleavelandite. This chalk-white mineral frequently forms rosettes on the other minerals in the pay streak. The occurrence of orthoclase in granite pegmatites has been questioned by some writers. The only way to distinguish with certainty orthoclase from microcline is by optical tests. According to such tests made by the writer, an individual crystal of feldspar may be partly perthitic microcline and partly perthitic orthoclase. While admittedly the bulk of the potash feldspar found in the Pala lithium pegmatites is microcline, orthoclase is nevertheless an abundant constituent. Quartz is, after feldspar, the most abundant mineral in the dikes. It is found (1) in graphic granite, (2) as anhedral masses, and (3) as well-formed crystals. Large crystals weighing a hundred pounds or more were common in many of the dikes. At one time thoughtless visitors to the mines thought the center of these crystals contained some prized gem mineral, so they smashed numerous quartz crystals that had been lying on the mine dumps. Both clear and smoky quartz crystals have been found, most of the larger ones are smoky at least in part. Muscovite in tiny crystals is found in practically all the dikes. It is especially common in the fine grained state in the graphic granite upper portions. In greenish, coarse grained crystals, it is abundant in the pay streak. Biotite is found in some of the lithium pegmatites. It almost always occurs in association with graphic granite in the upper portions of the dikes. Lepidolite, the lithium mica, in small quantities is a common constituent. It is found both fine grained and coarse grained. Wherever it occurs in large masses it is usually fine grained. At the Stewart mine lepodolite was found in large amounts, associated with rubellite, albite, and quartz. The miners have found that lepodolite is a good guide to the occurrence of gem tourmaline and that where lepidolite is absent, gem tourmaline is not likely to be found. Red or brown garnet is abundantly developed in most of the lithium pegmatites. It is one of the chief constituents of the so-called line rock, or garnet aplite, where it occurs as small, euhedral crystals in banded layers roughly parallel to the footwall, or in curved layers which resemble open folds. In the pay streak, garnet is common as rather large crystals, of the order of a centimeter or two in diameter. Although essonite has been reported from the pegmatites of Pala, the specimens examined by the writer are all spessartite, the manganese garnet. Tourmaline is extensively and abundantly developed in the lithium pegmatites of Pala. It occurs in two chief classes, black and lithium-bearing. Black tourmaline is found in the upper parts of the dikes, in some cases in oriented swarms. It also occurs as rather large crystals in the pay streak, and is not uncommon in the line rock. The lithium bearing, or gem tourmaline, possesses great interest to the collector because of its unusual beauty and hardness. The crystals may be entirely red, green, blue, or colorless, or combinations of these. Gem tourmaline is usually found in the dikes in pockets associated with clay and other minerals. Green tourmaline owes its color to iron, pink tourmaline to manganese, and colorless tourmaline to an even balance between manganese and iron. Beryl is found in sparing amounts in the pay streak of some of the dikes, especially those on Pala Chief Mountain. Both the common green beryl and pink beryl occur. 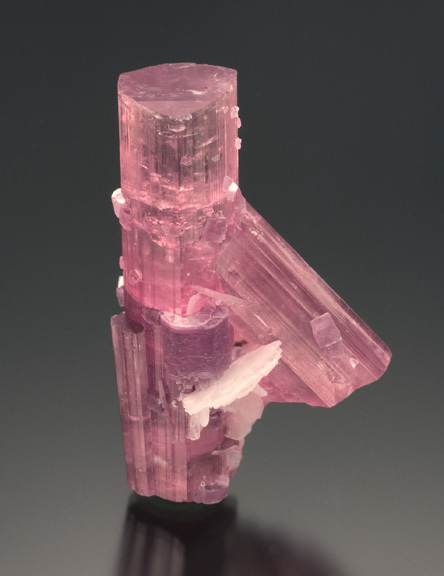 Pink beryl has been found in small quantities in the Tourmaline Queen mine and the Tourmaline King mine. The colorless, yellow and lilac varieties of transparent spodumene, which are found in gem form in only one other region of the world, the Island of Madagascar, were first discovered at Pala in 1902 on Hiriart Hill. Early in 1903 the Pala Chief mine was discovered and has yielded a large number of beautiful specimens of delicately-tinted transparent spodumene. These crystals were found in clay pockets, associated with tourmaline, beryl and other minerals. One of the attractive properties of some of these spodumene crystals is their pleochroism. 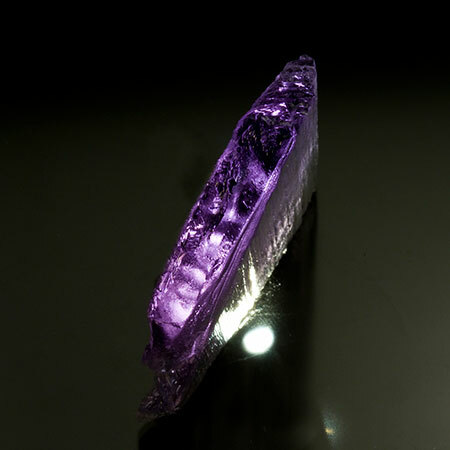 When the crystal is examined with the light traveling parallel to the cleavage a rather deep lilac tint is revealed; light traveling at right angles to the cleavage is not so affected and the crystal is colorless. Schaller reports bismuthinite occurring as an oxidation product of native bismuth at the Stewart mine. Associated with it is bismutosphaerite. Schaller described both bismuthinite and bismutosphaerite as oxidation products of native bismuth. The amount of bismuthinite found at the Stewart mine was very small and there is no record of it having been found elsewhere at Pala. This very rare mineral was found in small amount as an alteration product of native bismuth at the Stewart mine. It occurs as grayish-black masses and as yellow powder. At Pala bismite is found, usually admixed with more or less pucherite, as an earthy alteration product of native bismuth, or bismuthinite. Bismuth ocher, containing bismuth hydroxide, has been identified in specimens from the Stewart, Tourmaline King, and Tourmaline Queen mines. Bismutite is an amorphous earthly mineral found as an alteration product with other bismuth minerals at Pala. Bismutite has been found at the Stewart mine and may occur at the Tourmaline Queen and Tourmaline King mines. At Pala pucherite was found by Schaller as a yellow or gray ocher, mixed with bismite (bismuth hydroxide). Schaller thinks that the vanadium in pucherite, an alteration product of native bismuth, may have come from the gabbroic wall rock. From these two primary lithium-iron-manganese phosphates all the other secondary phosphates have been derived. Pure triphylite is Li Fe PO4; pure lithiophilite is Li Mn PO4. As found in nature triphylite always contains some manganese and lithiophilite always contains some iron. At Pala triphylite apparently altered more readily than lithiophilite. The most notable locality for manganese phosphate minerals is the Stewart mine, Pala. Here lithiophilite, palaite, hureaulite, stewardtite and associated phosphate minerals were found in a fine-grained mass of albite and lepidolite. Triplite, a massive and probably primary phosphate, is mentioned by Schaller as occurring at Pala with other phosphates. Palaite is a flesh-colored hydrous manganese phosphate, resulting from the alteration of lithiophilite. It forms crystalline masses in the cavities of which are found distinct crystals. Palaite alters to hureaulite. It occurs in the Stewart mine at Pala, from which the name of the mineral is derived. Salmonsite is found at the Stewart mine. It results from the partial oxidation and hydration of hureaulite, and forms cleavable masses of buff color, seamed by small veins of fibrous palaite and sprinkled with small masses of blue strengite. Sicklerite is found in cleavable masses at the Vanderburg-Naylor mine on Hiriart Hill near Pala. It is dark brown in color, with a light yellow-brown streak. Sicklerite results from the alteration of lithiophilite. Strengite is found rather frequently at Pala as an alteration product of triphylite, and perhaps, lithiophilite. It usually forms a blue crystalline coating on triphylite. Strengite has been reported from the Stewart, Tourmaline King, Tourmaline Queen, and Sickler mines.